Quilting frames are used to hold quilt layers in place as the quilter uses needle and thread to embellish the quilt. The most essential equipment of quilting is the quilting frame. 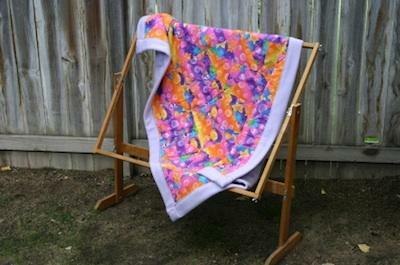 Some frames are small and handheld, and others are large enough for a group of people to stand around and hand quilt. Some quilt frames are designed to fit under a sewing machine for machine quilting. For hundreds of years women have gathered together for quilting bees, making quilts for special occasions or everyday life. Pioneer women used ingenuity in designing and building the first quilting frames. The typical historical quilting frame, which many people still use today, consisted of four lengths of wood, at least two of them long enough to hold the full length of the quilt. Each corner of the frame rested on legs or a stand. The end of the quilt was pinned to a cloth that was attached to the wood frame on one end, as the women finished that end of the quilt, they rolled the quilt around the end frame. At times when a pioneer women lived in a house with a parlor large enough, she would leave the quilt frame up so women could work on it at their leisure with out having to set it up and take it down. In houses too small to leave the frame up, some women devised a solution of lifting the quilt frame up to the ceiling and out of the way, and dropping it down when they had time to work on the quilt. One type of quilting frame does not fit all quilting situations; therefore there are many different types of frames to choose from. There are three basic types of quilt frames. Full Size Hand Quilting: A full size frame for large hand sewn quilts is often referred to as a stretcher frame. The quilt is fully stretched out and tacked on each side, the corners of the wood frame are held together with C-clamps and rests on legs. This frame is the easiest to make on your own. Three Roller Frame: This type of frame allows you to use either a machine to quilt or hand to quilt. The backing and batting are attached onto two roller boards and the top is on the third roller bar. The quilt is held taut as you move it through the roller system quilting as you go. Q-snap Floor Frame: This frame is made of PVC pipe. You lay the basted quilt over the top frame and clamp it down on all ends with a top frame. It works similarly to an embroidery hoop. The frame can be small enough to fit through a doorway and is lightweight and portable. Quilting frames come in many shapes, sizes, and designs. Find one that will fit your needs by looking through the lists of sites on the Internet. The Grace Company- This company has been manufacturing quilting products and frames for over 20 years. They have small quilting hoops for quilting one square at a time and large frames that are made to go directly under your sewing machine. The Ulmer Quilt Company has a patented quilting frame that makes hand quilting easy. The frame has six square feet of working area, which makes it easy for two people to work on the quilt while sitting next to each other. The frame is made of poplar, which is a very strong but lightweight wood. The Super Quilter is all about machine quilting on a frame. They claim their quilt frame is easy to set up and fun to use. Frank A. Edmunds Quilting Company has been in the quilting business for over 58 years. They have a variety of hand held quilting frames as well as stands and machine quilting frames. Making your own simple quilting frames for your women's group, church, or quilting group is easy. Sew the length of fabric in a tube big enough for all of the 2x2 wood board to slide through. Slide the boards into the tubes and staple into place. C-clamp all four corners of the 2x2 boards together to make the frame. Place the frame on top of the sawhorses. Take the quilt and fasten it to the long 2x2 boards with the jumbo safety pins. Stretch the quilt straight on the sides, and pin it along the sides as well.